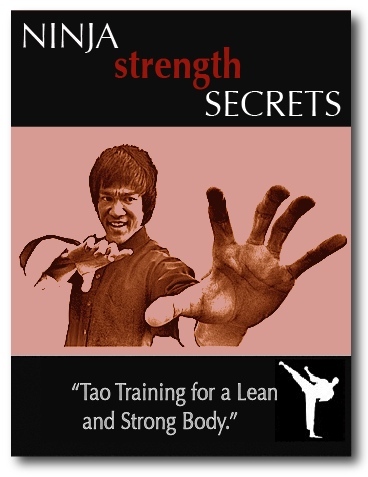 "Bruce Lee Body - The Power of Bruce Lee Physique Secrets"
Seeking a Bruce Lee body? Behold as we lay bare Bruce Lee physique secrets. If you were to draw up a shortlist of the most muscular men in history, martial artist Bruce Lee would likely feature near its top. Indeed, such was Lee's muscularity, that his physique was described by bodybuilding magnate Joe Weider as "the most defined body I've ever seen!" And the accolades don't stop there. The Lee physique would go onto influence other bodybuilders, such as Lee Haney, Lou Ferrigno, and six-times Mr. Olympia, Dorian Yates. But what is most remarkable, is how this "Little Dragon" stood 5 foot 8 inches tall in his stocking feet and tipped the scales at a meagre 140 pounds. So what was the Bruce Lee bodybuilding secret? The answer is quality. This quality is a primary reason the Bruce Lee physique holds up under scrutiny today and has survived to gain iconic status. Possessing what many consider to be the perfect blend of muscularity, definition and awesome symmetry, Lee would build a body that rippled and bulged as though he were chiseled from marble. Such amazing conditioning was further enhanced by a very low body fat percentage. How much body fat did Bruce Lee carry? Exercise physiologists put the rock bottom essential fat level in males at 3% fat. Such a number is important, as even in starvation, this figure only drops slightly because the body fights to keep its vital organ systems functioning and protected. In effect, a body fat level of 3% (or lower) equals "zero fat". To put this figure into context, when author and bodybuilder Clarence Bass had his body fat measured at Lovelace Medical Center on August, 1977, it was recorded at 2.4%. From this number, we can reasonably deduce that the extraordinarily lean Lee had a body fat percentage at 3% or lower. Yet these figures only tell us part of the story. What they don't show us is the strength of the Bruce Lee physique. Indeed, according to those who worked out with Lee from time to time - pound for pound - Lee might have been one of the most powerful men on the planet. 1. 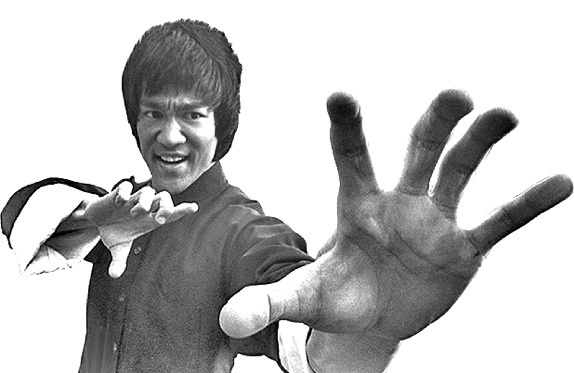 In 1964, Lee was invited to the Long Beach Karate Championships in California to perform his famous "One Inch Punch". His opponent that day was Bob Baker of Stockton, who later said: "I told Bruce not to do this type of demonstration again. When he punched me that last time, I had to stay home from work because the pain in my chest was unbearable." Consider how Lee's striking speed from 3 feet away was timed at 5 hundredths of a second, and this explains how Lee would often send opponents twice his size flying! 2. At the same Championships, Lee performed repetitions of his 2-finger press ups. 3. Such was Lee's strength, that he could support a 125 pound barbell at arms length for several seconds. 4. For a display of Bruce Lee fitness, the Hollywood star could execute 50 one-armed chin ups. 5. As a demonstration of power, Lee routinely thrust his fingers through unopened cans of Coca-Cola! We can see Bruce Lee created a quality physique that was strong, lightning-fast and with next-to-zero body fat. But how in blazes did this martial arts master do it? This is where Ninja Strength Secrets comes in, as we unmask one of the most unique and revolutionary strength training systems ever discovered. In fact, this system proved so effective that it prompted the author of perhaps the most critically acclaimed book on strength training to call them “the ultimate exercise”. The author of this groundbreaking book was Bill Starr; and years before he penned The Strongest Shall Survive, Starr was your quintessential 7-stone weakling. In competitive weightlifting, Bill March won everything in sight. These results were achieved with lifts that took just 6 seconds. No. That is not a misprint. Each of these lifts took a mere 6 seconds to build Superhuman strength. And the really exciting part? These lifts are guaranteed to work for you too. During the course of Ninja Strength Secrets, you'll learn how to train like Bruce Lee, as you test-drive the amazing “isometric” exercise system that helped precision-engineer his workouts. And finally, we review the abbreviated training variables you can use to breathe fire into your own workouts — including the revolutionary isometric exercise routines that took a bodybuilding wrecking ball to the record books. "I am a big believer in basic training. After incorporating your system into my routine, my strength has rocketed! Adding muscle and bags of energy - thank you!" "I got your Ninja Strength Secrets course and love it! I am a big fan of ultra-abbreviated training routines. I agree that time is most important. Why spend 3 hours doing something when you can do the same in less than an hour? Thanks so much." Sounds exciting, don't you agree? So if you’re tired of the same copycat routines, and you’re looking for a super-simple, efficient way to get stronger — and build more muscle in the least possible time — then simply click the “Buy” button below and begin your journey to a leaner, stronger you!